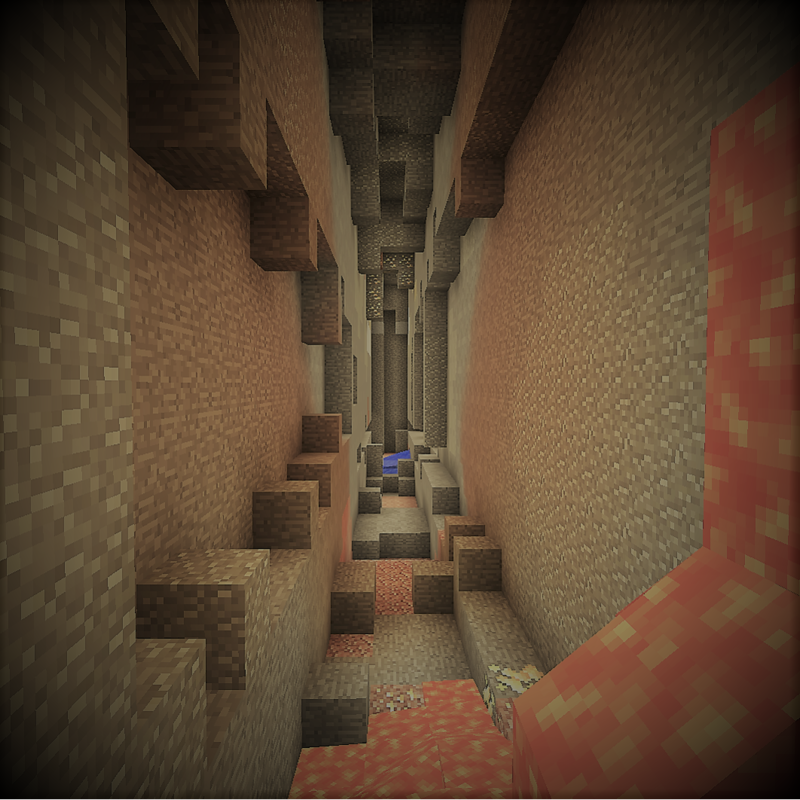 Cave Generator is a modification of Mojang's tunnel generation algorithm, used for creating cave-like openings in the overworld. It supports injecting overrides for almost any variable used in the process, and even adds a few options for creating different shapes. Additionally, users can apply decorations to flood caves with water, replace surfaces with grass, cover them with gravel, place stalagmites and stalactites, and more. Each cave preset has a percent selection chance, a height range, biome restrictions, and other parameters to help make them stand out and prompt exploration. Multiple presets can even be combined to create entirely new shapes. Cave Generator also supports a number of new features that would not ordinarily exist in vanilla, such as giant ore and stone clusters (multiple chunk radius), stone layers, dedicated stalagmite and stalactite generators, and even an entirely new, noise-based cavern generator. In addition, Cave Generator can be configured to run alongside some other cave generators, such as Worley's Caves. Take a look at the config file and set "otherGeneratorsEnabled" to true to enable this feature. Expect slower generation speeds. Because preset creation can initially be somewhat tedious, the mod includes a total of 13 example presets. By default, only the vanilla preset is enabled. It can be found under /config/cavegenerator/presets/, which is the cave preset directory. Open it up and take a look at the different categories to get a better idea of what can be done. To enable or disable presets, simply change "enabled" from false to true, or remove the line "enabled" altogether, as true is the default option. There is no need to restart the game for this to take effect; presets can be reloaded while in-game using the command "/cave reload." Use "/cave" to see which other commands are available. Suggestions and bug reports can be sent to GitHub. However, I welcome any feedback and am usually willing to discuss potential changes or additions to the mod on Discord. I'm also willing to help you get your presets setup exactly how you like them, so feel free to join us there! Here's a link. Fully customize Mojang's tunnels, ravines, and rooms to create a variety of different shapes and patterns by altering the frequencies, dimensions, angles, and more. Create your own noise-based cavern generation with all of the parameters from FastNoise and more. Spawn giant clusters and layers of stone. Decorate caves with stalactites, giant pillars, and nbt structures. Cover the ground with grass or other blocks, or replace the air with something different. Don't feel like messing with the settings? Try out all 13 of the included presets, or check the Discord server for more. Yes. I was just hoping Cave Generator to get to a better state before starting on that. But I could essentially start at any moment. Just not sure when quite yet. hanging spawner will always be a creeper spawner ? can i change it ? Yeah, you would just need to create some new structures and add them to the preset. Is it useless when this module works with the BOP? I can't find the cave ecology. Is this work with Quark Mod cave gen and blocks? It will definitely work with the blocks from Quark, but you'll of course have to create or find a preset that uses them. As far as Quark's cave generation, it depends what you're talking about. The actual caves generated by Quark (if enabled) may or may not work. You'll have to try enabling "otherGeneratorsEnabled" in the config file. The underground biomes spawned by Quark will absolutely work, though. Thank you so much for reporting this! I'm aware of and have fixed this bug, but I've made so many other changes to the code that I'm not quite ready to release that. Should be out in the next couple of days. Will you update to 1.13 (Forge)? Hey, there. I've thought about this a little and don't feel like I will. The reason is that Forge is so likely to get updated for 1.14 in the next month or two and I'd rather wait for that than have to redo everything back to back like that. Well, speaking with folks on Forge's discord, they said 1.14 will not be released soon, even because Mojang still havent released 1.14 yet. And the changes from 1.13>1.14 will be small, just like 1.11 > 1.12 for example. Sorry dude. The 0.13 update took me almost 5 months. You're just gonna have to give me some time. No problem! Just to let you know! Could you create a wiki on GitHub on how to use this mod? The vanilla.cave is really hard to read, and it does not explain informations like valid directions, what is replace match and replace original, etc. Also, if I replace all stone block with something else through wall decoration, no ore will spawn. Is it possible to only replace stone and leave the ore? Valid directions are currently "up," "down," "side," and "all." The difference between those fields is that "replace_match" effectively places blocks in the wall and "replace_original" effectively places blocks on the wall. In the previous versions of the mod, you would also replace air blocks (not just walls), so you were always just searching the surrounding blocks at each coordinate and either replacing where you found a match, or where you started. Those were the only names that made sense to me, at the time. Now that I've changed things, it's time for a rename, but I'm not sure just what, yet. In the meantime, if you want to suggest any changes, you should check out this survey. You can also join us on Discord for help in writing presets. I'm willing to help pretty much whenever I'm home. Edit: Also, it is not possible to avoid replacing ore blocks. The reason for this is that ore blocks do not exist yet when when those decorators get placed. I've used a similar setup and personally prefer a combination of StoneClusters and then use Ore Stone Variants to handle spawning ore variants directly in those blocks. The alternative is to use a different mod that will spawn those decorations at a later point in generation. Ver. 0.13 seems that the "/cave reload" command is not functioning. 1. Change cave generation settings while logging into the world and enter "/cave reload". 2. "Successfully reloaded caves." Is displayed, but the change is not reflected and there is no change even if you enter a new chunk. With Ver. 0.12, changes were reflected in "/reloadcaves" without re-logging into the world. Is "/cave reload" equivalent to "/reloadcaves"? Because I am not good at English, please forgive my poor sentences. Hi there. This is the intended functionality. I will consider how this can be changed in future versions, but for now, you'll need to reload the world.